The church of St. Luca the Evangelist is dedicated to the Patron of Praiano, and was built in elegant baroque style in 1588 on an existing structure dating back to 1123, then consequently restored in 1772. Beside the façade, which has been recently restored, there is the bell tower which is made up of three levels. Inside, the church is divided into three naves with six altars on each side. The central nave is covered by a barrel vault and the sides by cross vaults. 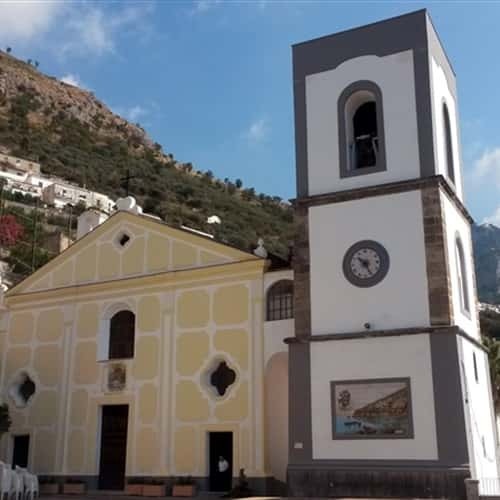 The majolica tiled dome makes this church unique as it is uncommon on the Amalfi coast . The floor inside the church is also done in this unique style which dates back to 1789 and depicts St. Luca surrounded by flowers and birds. From the rich patrimony there is the precious silver bust of the Saint kept in the sacristy and also two beautiful paintings, one dating back to the second half of the fifteenth century painted by Giovanni Bernardo Lama which represents the circumcision; the second one was painted by Padovano De Martino dating back to 1582 and it represents Our Lady of the Rosary. St Luca Evangelist, Patron Saint of Praiano, is celebrated on October 18th; on Easter Monday; on the first Weekend of July.